The Rams were the worst team in the NFL in 2009, finishing 1-15. You could argue they were the best team in the league last year, going 13-3 and losing in the Super Bowl. They spent more time near the bottom than the top in the intervening years — the team went 41-86-1 in the eight years before Sean McVay took over — but it’s still been a big ride back to the top of the league. All that, and the team (finally) has an offense again. The Jeff Fisher years weren’t only fallow in terms of wins, they were miserable in terms of points. The team having a productive offense the last two years has been fun. Let’s take a look at the best Rams fantasy seasons of the last decade. Before Goff’s rookie season, I wrote that he had every chance to be the Rams’ best quarterback in a long time, if for no other reason than that was a hideously low bar to clear. I was a year early, but generally correct — he’s averaged more than 280 fantasy points over the last two years, and no other quarterback for the team has topped 230 in the last decade (or since 2006, in fact). Goff made a huge jump from Year 1 to Year 2, then made another into Year 3, upping his production by nearly 60 points. If he can ride that wave and the team’s formidable offense, he can put together a nice little run. Gurley probably would have topped those numbers in 2018 if not for his late-season injury. And both seasons are more than 120 points clear of any other Rams RB in our timespan. But my favorite note about Gurley’s 2017 is that he went into Week 17 as the running back leader in both rushing and receiving yards … and then sat in Week 17 and was passed by, respectively, Kareem Hunt and Alvin Kamara and didn’t end up leading the league in either stat. The Rams have had two receivers top 200 PPR points in the last decade, and both happened last year, with Brandin Cooks joining Woods. If Cooper Kupp hadn’t gotten injured, there’s every chance he’d have joined them as well, as he put up 135.1 points in only 8 games. But it’s Woods who interests us the most here. After a so-so stretch in Buffalo, Woods signed a five-year deal with the Rams before 2017 in a deal that most of the football community mocked. Instead, he’s been one of the league’s best receivers for two years now (one of, Troy Aikman, one of), and is an unqualified success. Unlike the other positions, the rising tide hasn’t lifted the tight end boats for the Rams the last two years, mostly intentionally. As such, Cook’s 2013 stands atop a modest collection of TE seasons over the last decade (and his 2014 comes in second). 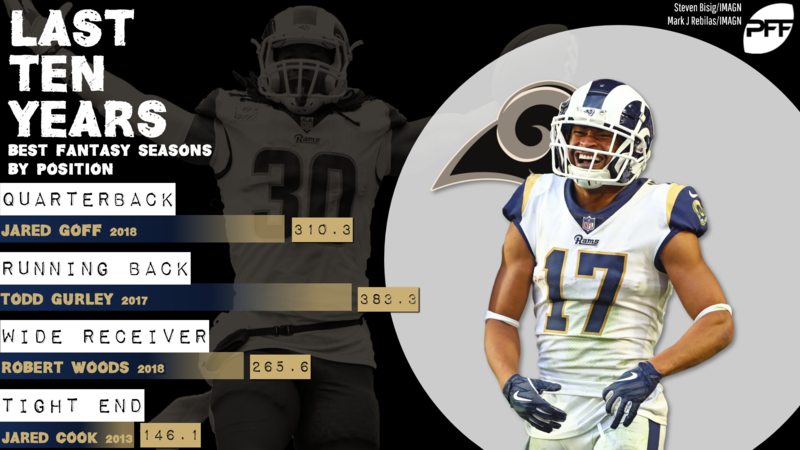 Unlike his Raiders tenure, when he put up the team’s best season with a genuinely good 2018, Cook’s 2013 would only have led the Bills and Cardinals in addition to the Rams over the last decade. He was the best. It wasn’t very hard to be that.